This article is about the sport played on horseback. For other uses, see Polo (disambiguation). Polo is a horseback mounted team sport. It is one of the world's oldest known team sports. A game of Central Asian origin, polo was first played in Persia (Iran) at dates given from the 6th century BC to the 1st century AD. Polo was at first a training game for cavalry units, usually the king’s guard or other elite troops. From there it spread to entire Persia and beyond. It is now popular around the world, with well over 100 member countries in the Federation of International Polo. It is played professionally in 16 countries. It was an Olympic sport from 1900 to 1936. It is known as the sport of kings. It has become a spectator sport for equestrians and society, often supported by sponsorship. The game is played by two opposing teams with the objective of scoring goals by using a long-handled wooden mallet to hit a small hard ball through the opposing team's goal. Each team has four mounted riders, and the game usually lasts one to two hours, divided into periods called chukkas (or "chukkers"). Arena polo has similar rules, and is played with three players per team. The playing area is smaller, enclosed, and usually of compacted sand or fine aggregate, often indoors. Arena polo has more maneuvering due to space limitations, and uses an air inflated ball, slightly larger than the hard field polo ball. Standard mallets are used, though slightly larger head arena mallets are an option. Although the exact origins of the game are unknown it most likely began as a simple game played by mounted Iranian nomads in Central Asia, from where it spread to Persia and beyond. In time polo became a Persian national sport played extensively by the nobility. Women played as well as men. During the period of the Parthian Empire (247 BC to 224 AD), the sport had great patronage under the kings and noblemen. According to the Oxford Dictionary of Late Antiquity, polo (known as čawgān in Middle Persian, i.e. chovgan), was a Persian ball game and an important pastime in the court of the Sasanian Empire (224-651). It was also part of royal education for the Sasanian ruling class. Emperor Shapur II learnt to play polo when he was seven years old in 316 AD. Known as chovgan it is still played in the region today. 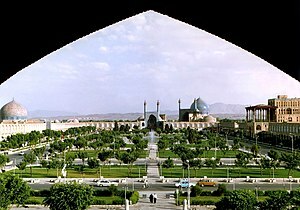 Naqsh-e Jahan Square in Isfahan is the site of a mediaeval royal polo field. Valuable for training cavalry, the game was played from Constantinople to Japan by the Middle Ages. The game also spread south to Arabia and to India and Tibet. 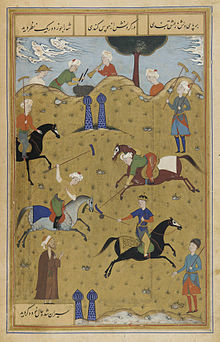 The game continued to be supported by Mongol rulers of Persia in the 11th century, as well as under the Safavid dynasty. In the 17th century, Naqsh-i Jahan Square in Isfahan was built as a polo field by King Abbas I. The game was also learnt by the neighbouring Byzantine Empire at an early date. A tzykanisterion (stadium for playing tzykanion, the Byzantine name for polo) was built by emperor Theodosius II (r. 408–450) inside the Great Palace of Constantinople. Emperor Basil I (r. 867–886) excelled at it; Emperor Alexander (r. 912–913) died from exhaustion while playing and John I of Trebizond (r. 1235–1238) died from a fatal injury during a game. After the Muslim conquests to the Ayyubid and Mameluke dynasties of Egypt and the Levant, their elites favoured it above all other sports. Notable sultans such as Saladin and Baybars were known to play it and encourage it in their court. Polo sticks were features on the Mameluke precursor to modern day playing cards. The game spread to South Asia where it has had a strong presence in the north western areas of present-day Pakistan (including Gilgit, Chitral, Hunza and Baltistan) since at least the 15th-16th century. The name polo is said to have been derived from the Balti word "pulu", meaning ball. Qutubuddin Aibak, the Turkic slave from Central Asia who later became the Sultan of Delhi in Northern India, ruled as a Sultan for only four years, from 1206 to 1210, dying an accidental death during a game of polo when his horse fell and he was impaled on the pommel of his saddle. Polo likely travelled via the Silk Road to China where it was popular in the Chinese Tang dynasty capital of Chang'an, and also played by women, who wore male dress to do so; many Tang dynasty tomb figures of female players survive. According to the Oxford Dictionary of Late Antiquity, the popularity of polo in Tang China was "bolstered, no doubt, by the presence of the Sasanian court in exile". An archaic variation of polo, regionally referred to as buzkashi or kokpar, is still played in parts of Asia. The modern game of polo is derived from Manipur, India, where the game was known as 'Sagol Kangjei', 'Kanjai-bazee', or 'Pulu'. It was the anglicised form of the last, referring to the wooden ball that was used, which was adopted by the sport in its slow spread to the west. The first polo club was established in the town of Silchar in Assam, India, in 1833. The origins of the game in Manipur are traced to early precursors of Sagol Kangjei. This was one of three forms of hockey in Manipur, the other ones being field hockey (called Khong Kangjei) and wrestling-hockey (called Mukna Kangjei). Local rituals such as those connected to the Marjing, the Winged-Pony God of Polo and the creation-ritual episodes of the Lai Haraoba festival enacting the life of his son, Khori-Phaba, the polo-playing god of sports. These may indicate an origin earlier than the historical records of Manipur. Later, according to Chaitharol-Kumbaba, a Royal Chronicle of Manipur King Kangba who ruled Manipur much earlier than Nongda Lairen Pakhangba (33 AD) introduced Sagol Kangjei (Kangjei on horse back). Further regular playing of this game commenced in 1605 during the reign of King Khagemba under newly framed rules of the game. However it was the first Mughal emperor, Babur, who popularised the sport in India and ultimately made a significant influence on England. In Manipur, polo is traditionally played with seven players to a side. The players are mounted on the indigenous Manipuri pony, which stands less than 13 hands (52 inches, 132 cm). There are no goal posts, and a player scores simply by hitting the ball out of either end of the field. Players strike the ball with the long side of the mallet head, not the end. Players are not permitted to carry the ball, although blocking the ball with any part of the body except the open hand is permitted. The sticks are made of cane, and the balls are made from the roots of bamboo. Players protected their legs by attaching leather shields to their saddles and girths. In Manipur, the game was played even by commoners who owned a pony. The kings of Manipur had a royal polo ground within the ramparts of their Kangla Fort. Here they played Manung Kangjei Bung (literally, "Inner Polo Ground"). Public games were held, as they are still today, at the Mapan Kangjei Bung (literally "Outer Polo Ground"), a polo ground just outside the Kangla. Weekly games called Hapta Kangjei (Weekly Polo) were also played in a polo ground outside the current Palace. The oldest polo ground in the world is the Imphal Polo Ground in Manipur State. The history of this pologround is contained in the royal chronicle "Cheitharol Kumbaba" starting from AD 33. Lieutenant (later Major General) Joseph Ford Sherer, the father of modern polo visited the state and played on this polo ground in the 1850s. Lord Curzon, the Viceroy of India visited the state in 1901 and measured the polo ground as "225 yards long and 110 yards wide" 225 by 110 yards (206 by 101 m). In 1862 the oldest polo club still in existence, Calcutta Polo Club, was established by two British soldiers, Sherer and Captain Robert Stewart. Later they spread the game to their peers in England. The British are credited with spreading polo worldwide in the late 19th century and the early 20th century at the height of its empire. Military officers imported the game to Britain in the 1860s. The establishment of polo clubs throughout England and western Europe followed after the formal codification of rules. The 10th Hussars at Aldershot, Hants, introduced polo to England in 1834. The game's governing body in the United Kingdom is the Hurlingham Polo Association, which drew up the first set of formal British rules in 1874, many of which are still in existence. This version of polo played in the 19th century was different from the faster form that was played in Manipur. The game was slow and methodical, with little passing between players and few set plays that required specific movements by participants without the ball. Neither players nor horses were trained to play a fast, nonstop game. This form of polo lacked the aggressive methods and equestrian skills to play. From the 1800s to the 1910s, a host of teams representing Indian principalities dominated the international polo scene. The Champions polo league was launched in Jaipur in 2016. It is a new version of polo, similar to the T20 format of cricket. The pitch was made smaller and accommodated a huge audience. The First Event of the World Champions Polo League took place in Bhavnagar, Gujarat, with room for 10,000 spectators. The rules were changed and the duration was made shorter. Officially played 7–9 April in Bhavnagar, including India's most decorated polo player Samir Suhag, Shamsher Ali, foreign players Richard Henriques from Ireland and South Africa and others participated. Six teams were launched and Iscon Hemvijaya emerged the winner, while IPCL were runners up. British settlers in the Argentine pampas started practicing polo during their free time. Among them, David Shennan is credited with having organised the first formal polo game of the country in 1875, at Estancia El Negrete, located in the province of Buenos Aires. The sport spread quickly between the skilful gauchos, and several clubs opened in the following years in the towns of Venado Tuerto, Cañada de Gómez, Quilmes, Flores and later (1888) Hurlingham. In 1892 The River Plate Polo Association was founded and constituted the basis for the current Asociación Argentina de Polo. In the Olympic Games held in Paris in 1924 a team composed by Juan Miles, Enrique Padilla, Juan Nelson, Arturo Kenny, G. Brooke Naylor and A. Peña obtained the first gold medal for the country's olympic history; this also occurred in Berlin 1936 with players Manuel Andrada, Andrés Gazzotti, Roberto Cavanagh, Luis Duggan, Juan Nelson, Diego Cavanagh, and Enrique Alberdi. The game spread across the country, and Argentina is credited globally as the capital of polo; Argentina is notably the country with the largest number ever of 10 handicap players in the world. Five teams were able to gather four 10 handicap players each, to make 40 handicap teams: Coronel Suárez, 1975, 1977–1979 (Alberto Heguy, Juan Carlos Harriott, Alfredo Harriot and Horacio Heguy); La Espadaña, 1989–1990 (Carlos Gracida, Gonzalo Pieres, Alfonso Pieres y Ernesto Trotz Jr.); Indios Chapaleufú, 1992–1993 (Bautista Heguy, Gonzalo Heguy, Horacio Heguy Jr. and Marcos Heguy); La Dolfina, 2009–2010 (Adolfo Cambiaso Jr., Lucas Monteverde, Mariano Aguerre y Bartolomé Castagnola); Ellerstina, 2009 (Facundo Pieres, Gonzalo Pieres Jr., Pablo Mac Donough and Juan Martín Nero). The three major polo tournaments in Argentina, known as "Triple Corona" ("Triple Crown"), are Hurlingham Polo Open, Tortugas Polo Open and Palermo Polo Open. Polo season usually lasts from October to December. Polo has found popularity throughout the rest of the Americas, including Brazil, Chile, Mexico, and the United States of America. 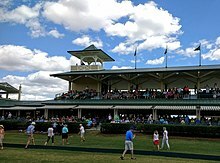 Polo Stadium in The Villages Florida. James Gordon Bennett Jr. on May 16, 1876 organized what was billed as the first polo match in the United States at Dickel's Riding Academy at 39th Street and Fifth Avenue in New York City. The historical record states that James Gordon Bennett established the Westchester Polo Club on May 6, 1876 and on May 13, 1876 the Jerome Park Racetrack in Westchester County (now Bronx County) was the site of the "first" American outdoor polo match. H.L. Herbert, James Gordon Bennett and August Belmont financed the original New York Polo Grounds. Herbert stated in a 1913 article that they formed the Westchester Club after the "first" outdoor game was played on 13 May 1876. This contradicts the historical record of the club being established before the Jerome Park game.. There is ample evidence that the first to play polo in America was actually the English Texans. The Galveston News reported on 2 May 1876 that Denison Texas had a Polo Club which was before James Gordon Bennett established his Westchester Club or attempted to play the "first" game. The Denison team sent a letter to James Gordon Bennett challenging him to a match game. The challenge was published June 2, 1876 in The Galveston Daily News. By the time the article came out on June 2, the Denison Club had already received a letter from Bennett indicating the challenge was offered before the "first" games in New York. 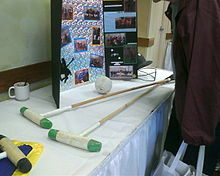 There is also an urban legend that the first game of polo in America was played in Boerne, Texas at retired British officer Captain Glynn Turquand's famous Balcones Ranch The Boerne, Texas legend also has plenty of evidence pointing to the fact that polo was played in Boerne before James Gordon Bennett Jr. ever picked up a polo mallet. During the early part of the 20th century, under the leadership of Harry Payne Whitney, polo changed to become a high-speed sport in the United States, differing from the game in England, where it involved short passes to move the ball towards the opposition's goal. Whitney and his teammates used the fast break, sending long passes downfield to riders who had broken away from the pack at a full gallop. 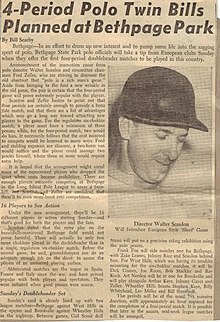 In the late 1950s, champion polo player and Director of the Long Island Polo Association, Walter Scanlon, introduced the "short form", or "European" style, four period match, to the game of polo. The rules of polo are written for the safety of both players and horses. Games are monitored by umpires. A whistle is blown when an infraction occurs, and penalties are awarded. Strategic plays in polo are based on the "line of the ball", an imaginary line that extends through the ball in the line of travel. This line traces the ball's path and extends past the ball along that trajectory. The line of the ball defines rules for players to approach the ball safely. The "line of the ball" changes each time the ball changes direction. The player who hits the ball generally has the right of way, and other players cannot cross the line of the ball in front of that player. As players approach the ball, they ride on either side of the line of the ball giving each access to the ball. A player can cross the line of the ball when it does not create a dangerous situation. Most infractions and penalties are related to players improperly crossing the line of the ball or the right of way. When a player has the line of the ball on his right, he has the right of way. A "ride-off" is when a player moves another player off the line of the ball by making shoulder-to-shoulder contact with the other players' horses. The defending player has a variety of opportunities for his team to gain possession of the ball. He can push the opponent off the line or steal the ball from the opponent. Another common defensive play is called "hooking." While a player is taking a swing at the ball, his opponent can block the swing by using his mallet to hook the mallet of the player swinging at the ball. A player may hook only if he is on the side where the swing is being made or directly behind an opponent. A player may not purposely touch another player, his tack or pony with his mallet. Unsafe hooking is a foul that will result in a penalty shot being awarded. For example, it is a foul for a player to reach over an opponent's mount in an attempt to hook. The other basic defensive play is called the bump or ride-off. It's similar to a body check in hockey. In a ride-off, a player rides his pony alongside an opponent's mount in order to move an opponent away from the ball or to take him out of a play. It must be executed properly so that it does not endanger the horses or the players. The angle of contact must be safe and can not knock the horses off balance, or harm the horses in any way. Two players following the line of the ball and riding one another off have the right of way over a single man coming from any direction. Like in hockey or basketball, fouls are potentially dangerous plays that infringe on the rules of the game. To the novice spectator, fouls may be difficult to discern. There are degrees of dangerous and unfair play and penalty shots are awarded depending based on the severity of the foul and where the foul was committed on the polo field. White lines on the polo field indicate where the mid-field, sixty, forty and thirty yard penalties are taken. The official set of rules and rules interpretations are reviewed and published annually by each country's polo association. Most of the smaller associations follow the rules of the Hurlingham Polo Association, the national governing body of the sport of polo in the United Kingdom, and the United States Polo Association. Outdoor or field polo consists of four to eight 7-minute chukkas, between or during which players change mounts. At the end of each 7 minute chukka, play continues for an additional 30 seconds or until a stoppage in play, whichever comes first. There is a four-minute interval between chukkas and a ten-minute halftime. Play is continuous and is only stopped for rule infractions, broken tack (equipment) or injury to horse or player. The object is to score goals by hitting the ball between the goal posts, no matter how high in the air. If the ball goes wide of the goal, the defending team is allowed a free 'knock-in' from the place where the ball crossed the goal line, thus getting ball back into play. Arena polo has rules similar to the field version, and is less strenuous for the player. It is played in a 300 by 150 feet (91 by 46 m) enclosed arena, much like those used for other equestrian sports; the minimum size is 150 by 75 feet (46 by 23 m). There are many arena clubs in the United States, and most major polo clubs, including the Santa Barbara Polo & Racquet Club, have active arena programmes. The major differences between the outdoor and indoor games are: speed (outdoor being faster), physicality/roughness (indoor/arena is more physical), ball size (indoor is larger), goal size (because the arena is smaller the goal is smaller), and some penalties. In the United States and Canada, collegiate polo is arena polo; in the UK, collegiate polo is both. Forms of arena polo include beach polo, played in many countries between teams of three riders on a sand surface, and cowboy polo, played almost exclusively in the western United States by teams of five riders on a dirt surface. Snow polo is not the same sport as ice polo, which was popular in the US in the late 1890s. The sport resembled ice hockey and bandy but died out entirely in favour of the Canadian ice hockey rules. A popular combination of the sports of polo and lacrosse is the game of polocrosse, which was developed in Australia in the late 1930s. These sports are considered as separate sports because of the differences in the composition of teams, equipment, rules, game facilities etc. Polo is not played exclusively on horseback. Such polo variants are mostly played for recreational or tourist purposes; they include canoe polo, cycle polo, camel polo, elephant polo, golfcart polo, Segway polo and yak polo. In the early 1900s in the United States, cars were used instead of horses in the sport of Auto polo. Hobby Horse Polo is using hobby horses instead of ponies. It uses parts of the polo rules but has its own specialities, as e.g. 'punitive sherries'. The Hobby Horse variant started 1998 as a fun sport in south western Germany and lead 2002 to the foundation of the First Kurfürstlich-Kurpfälzisch Polo-Club in Mannheim. In the meantime it gained further interest in other German cities. All tournaments and levels of play and players are organized within and between polo clubs, including membership, rules, safety, fields and arenas. Club Polo (or County Polo in the UK) is usually overseen by qualified mounted instructors or umpires. In the UK the original County Polo Association was formed in 1898* to look after the interests of the country clubs and to run the County Cup Tournaments, the three London polo clubs—Hurlingham, Ranelagh and Roehampton—and from all associations within the Empire where polo was being played. The mounts used are called 'polo ponies', although the term pony is purely traditional and the mount is actually a full-sized horse. They range from 14.2 to 16 hands (58 to 64 inches, 147 to 163 cm) high at the withers, and weigh 900–1,100 pounds (410–500 kg). The polo pony is selected carefully for quick bursts of speed, stamina, agility and manoeuvrability. Temperament is critical; the horse must remain responsive under pressure and not become excited or difficult to control. Many are Thoroughbreds or Thoroughbred crosses. They are trained to be handled with one hand on the reins, and to respond to the rider's leg and weight cues for moving forward, turning and stopping. A well trained horse will carry its rider smoothly and swiftly to the ball and can account for 60 to 75 percent of the player's skill and net worth to his team. Polo pony training generally begins at age three and lasts from about six months to two years. Most horses reach full physical maturity at about age five, and ponies are at their peak of athleticism and training at around age 6 or 7. However, without any accidents, polo ponies may have the ability to play until they are 18 to 20 years of age. The Argentine Polo Breeders Association (which is the organization that registers this Argentine Polo Pony breed) has indicated that on average, this race has a height of 1.56 meters and an average weight between 400 and 500 kilos. Each player must have more than one horse, to allow for tired mounts to be replaced by fresh ones between or even during chukkas. A player's "string" of polo ponies may number 2 or 3 in Low Goal matches (with ponies being rested for at least a chukka before reuse), 4 or more for Medium Goal matches (at least one per chukka), and even more for the highest levels of competition. Each team consists of four mounted players, which can be mixed teams of both men and women. Number One is the most offence-oriented position on the field. The Number One position generally covers the opposing team's Number Four. Number Two has an important role in offence, either running through and scoring themselves, or passing to the Number One and getting in behind them. Defensively, they will cover the opposing team's Number Three, generally the other team's best player. Given the difficulty of this position, it is not uncommon for the best player on the team to play Number Two so long as another strong player is available to play Three. Number Three is the tactical leader and must be a long powerful hitter to feed balls to Number Two and Number One as well as maintaining a solid defence. The best player on the team is usually the Number Three player, usually wielding the highest handicap. Number Four is the primary defence player. They can move anywhere on the field, but they usually try to prevent scoring. The emphasis on defence by the Number Four allows the Number Three to attempt more offensive plays, since they know that they will be covered if they lose the ball. Polo must be played right-handed in order to prevent head-on collisions. The rules for equipment vary in details between the hosting authorities, but are always for the safety of the players and mounts. Mandatory equipment includes a protective helmet with chinstrap worn at all times by all players and mounted grooms. They must be to the locally accepted safety standard, PAS015 (UK), NOCSAE (USA). 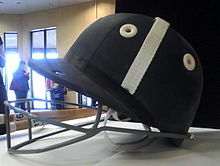 A faceguard is commonly integral with a helmet. Polo boots and kneeguards are mandatory in the UK during official play, and boots are recommended for all play everywhere. The UK also recommends goggles, elbow pads and gum shields. A shirt or jersey is required that distinguishes the player's team, and is not black and white stripes like an umpire shirt. White polo pants or trousers are worn during official play. Polo gloves are commonly worn to protect from working the reins and mallet. Not permitted is any equipment that may harm horses, like certain spurs or whips. The modern outdoor polo ball is made of a high-impact plastic. Historically they have been made of bamboo, leather covered cork, hard rubber, and for many years willow root. Originally the British used a white painted leather covered cricket ball. The regulation outdoor polo ball is 3 inches (7.6 cm) to 3 1⁄2 inches (8.9 cm) in diameter and weighs 3 1⁄2 ounces (99 g) to 4 1⁄2 ounces (130 g). Plastic balls were introduced in the 1970s. They are less prone to breakage and much cheaper. The indoor and arena polo ball is leather-covered and inflated, and is about 4 1⁄2 inches (11 cm) in diameter. It must be not less than 12.5 inches (32 cm) or more than 15 inches (38 cm) in circumference. The weight must be not less than 170 grams (6.0 oz) or more than 182 grams (6.4 oz). In a bounce test from 9 feet (2.7 m) on concrete at 70 °F (21 °C), the rebound should be a minimum of 54 inches (140 cm) and a maximum of 64 inches (160 cm) at the inflation rate specified by the manufacturer. This provides for a hard and lively ball. The polo mallet comprises a cane shaft with a rubber-wrapped grip, a webbed thong, called a sling, for wrapping around the thumb, and a wooden cigar-shaped head. The shaft is made of manau-cane (not bamboo, which is hollow) although a small number of mallets today are made from composite materials. Composite materials are usually not preferred by top players because the shaft of composite mallets can't absorb vibrations as well as traditional cane mallets. The mallet head is generally made from a hardwood called tipa, approximately 9​1⁄4" inches long. The mallet head weighs from 160 g (5.6 oz) to 240 g (8.5 oz), depending on player preference and the type of wood used, and the shaft can vary in weight and flexibility depending on the player's preference. The weight of the mallet head is of important consideration for the more seasoned players. Female players often use lighter mallets than male players. For some polo players, the length of the mallet depends on the size of the horse: the taller the horse, the longer the mallet. However, some players prefer to use a single length of mallet regardless of the height of the horse. Either way, playing horses of differing heights requires some adjustment by the rider. Variable lengths of the mallet typically range from 127 cm (50 in) to 134 cm (53 in). The term mallet is used exclusively in US English; British English prefers the term polo stick. The ball is struck with the broad sides of the mallet head rather than its round and flat tips. Polo saddles are English-style, close contact, similar to jumping saddles; although most polo saddles lack a flap under the billets. Some players will not use a saddle blanket. The saddle has a flat seat and no knee support; the rider adopting a forward-leaning seat and closed knees dissimilar to a classical dressage seat. A breastplate is added, usually attached to the front billet. A standing martingale must be used: so, a breastplate is a necessity for safety. The tie-down is usually supported by a neck strap. Many saddles also have an overgirth. The stirrup irons are heavier than most, and the stirrup leathers are wider and thicker, for added safety when the player stands in the stirrups. The legs of the pony are wrapped with polo wraps from below the knee to the fetlock to minimize pain. Jumping (open front) or gallop boots are sometimes used along with the polo wraps for added protection. Often, these wraps match the team colours. The pony's mane is most often roached (hogged), and its tail is docked or braided so that it will not snag the rider's mallet. Polo is ridden with double reins for greater accuracy of signals. The bit is frequently a gag bit or Pelham bit. In both cases, the gag or shank rein will be the bottom rein in the rider's hands, while the snaffle rein will be the top rein. If a gag bit is used, there will be a drop noseband in addition to the cavesson, supporting the tie-down. One of the rein sets may alternately be draw reins. Relative sizes of an association football ground and a polo field. The playing field is 300 by 160 yards (270 by 150 m), the area of approximately six soccer fields or 9 football fields (10 acres)., while arena polo is 96 x 46 metres. The playing field is carefully maintained with closely mowed turf providing a safe, fast playing surface. Goals are posts which are set eight yards apart, centred at each end of the field. The surface of a polo field requires careful and constant grounds maintenance to keep the surface in good playing condition. During half-time of a match, spectators are invited to go onto the field to participate in a polo tradition called "divot stamping", which was developed not only to help replace the mounds of earth (divots) that are torn up by the horses' hooves, but also to afford spectators the opportunity to walk about and socialise. Polo is played professionally in many countries, notably Argentina, Australia, Brazil, Canada, Chile, Dominican Republic, France, Germany, Iran, India, New Zealand, Mexico, Pakistan, Jamaica, Spain, South Africa, Switzerland, the United Kingdom, and the United States, and is now an active sport in 77 countries, and although its tenure as an Olympic sport was limited to 1900–1939, in 1998 the International Olympic Committee recognised it as a sport with a bona fide international governing body, the Federation of International Polo. The World Polo Championship is held every three years by the Federation of International Polo. 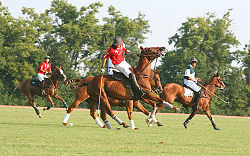 Polo is unique among team sports in that amateur players, often the team patrons, routinely hire and play alongside the sport's top professionals. The most important tournaments of the world, in a clubs level, are Abierto de Tortugas, Abierto de Hurlingham and Abierto Argentino de Polo, all of them in Argentina (la Triple Corona). The United States Polo Association (USPA) is the governing body for polo in the U.S. The U.S. is the only country that has separate women's polo, run by the United States Women's Polo Federation. Polo has been played in Malaysia and Singapore, both of which are former British colonies, since being introduced to Malaya in during the late 19th century. Royal Johor Polo Club was formed in 1884 and Singapore Polo Club was formed in 1886. The oldest polo club in the modern country of Malaysia is Selangor Polo Club, founded in 1902. It was largely played by royalty and the political and business elite. Polo was played at the 2007 Southeast Asian Games and 2017 Southeast Asian Games. Nations that competed in the tournament were Indonesia, Singapore, Malaysia, Thailand and Philippines (2007) and Brunei, Malaysia, Singapore and Thailand (2017). The 2007 tournament's gold medal was won by the Malaysian team, followed by Singapore with silver and Thailand with bronze while the 2017 tournament's gold medal was won by Malaysia, followed by Thailand with silver and Brunei with bronze. The recent resurgence in south-east Asia has resulted in its popularity in cities such as Pattaya, Kuala Lumpur and Jakarta. In Pattaya alone, there are 3 active polo clubs: Polo Escape, Siam Polo Park and the Thai Polo and Equestrian Club. Indonesia has a polo club (Nusantara Polo Club). More recently, Janek Gazecki and Australian professional Jack "Ruki" Baillieu have organised polo matches in parks "around metropolitan Australia, backed by wealthy sponsors." A Chinese Equestrian Association has been formed with two new clubs in China itself: the Beijing Sunny Time Polo Club, founded by Xia Yang in 2004 and the Nine Dragons Hill Polo Club in Shanghai, founded in 2005. Polo is not widely spread in West Asia, but still counts 5 active clubs in Iran, 4 active polo clubs in the UAE, one club in Bahrain  and The Royal Jordanian Polo Club, in Amman, Jordan. Polo in Iran is governed by the Polo Federation of Iran. There are five polo clubs in Iran: Ghasr-e Firoozeh, Nowroozabad, Army Ground Forces, Kanoon-e Chogan and Nesf-e Jahan. Iran possesses some of the best grass polo fields in the region. The country currently has over 100 registered players of which approximately 15% are women. Historically, Kurdish and Persian Arabian horses were the most widely used for polo. This was probably also the case in ancient times. Today Thoroughbreds are being increasingly used alongside the Kurdish and Persian Arabian horses. Some players have also been experimenting with Anglo-Arabians. Iranians still refer to the game of polo by its original Persian name of "Chogan", which means mallet. Iranians still maintain some of the ancient rituals of the game in official polo matches. Polo first began its Irish history in 1870 with the first official game played on Gormanstown Strand, Co. Meath. Three years later the All Ireland Polo Club was founded by Mr. Horace Rochford in the Phoenix Park. Since then the sport has continued to grow with a further seven clubs opening around the country. The sport has also been made more accessible by these clubs by the creation of more affordable training programmes such as from beginner to pro programme at Polo Wicklow. 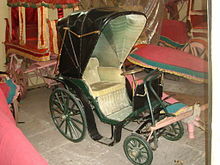 An old Polocart displayed at City Palace, Jaipur. The museum also displays a "night polo ball" with a rotating platform on which a candle is placed. Sagol Kangjei, discussed above, is arguably a version of polo though it can also be seen as the precursor of modern outdoor polo. Cowboy polo uses rules similar to regular polo, but riders compete with western saddles, usually in a smaller arena, using an inflatable rubber medicine ball. Horseball is a game played on horseback where a ball is handled and points are scored by shooting it through a high net. The sport is a combination of polo, rugby, and basketball. Pato was played in Argentina for centuries, but is much different than modern polo. No mallets are used, and it is not played on grass. 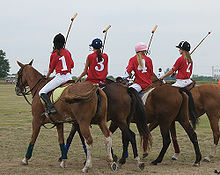 Polocrosse is another game played on horseback, a cross between polo and lacrosse. Water polo shares a name with polo, but more closely resembles handball. Auto polo was a motorsport invented in the United States with rules and equipment similar to polo but using automobiles instead of horses. Cycle polo is a similar game played on bicycles instead of horses. Elephant polo is played in South Asia. Motoball (Motorcycle Polo) was invented in the United States. Segway polo originated in the United States. Yak polo is played in Mongolia and western China. Camel polo is played in Mongolia. ^ "THE HISTORY OF POLO". www.argentinapolo.com. ^ Heitner, Darren. "The Economics Of Polo, The Sport Of Kings". Forbes. Retrieved 9 August 2018. ^ Laffaye, Horace A. (19 January 2010). The Evolution of Polo. McFarland. pp. 5–6. It can be safely assumed that it [polo] began as a simple folk game played by the nomadic tribes in central Asia. Westward and eastward expansion followed, to Byzantium and China, most likely along the trail of the Silk Road. ^ Hong, Fan; Mangan (18 November 2005). Evolution of Sport in Asian Society: Past and Present. Routledge. pp. 309–311. In all probability polo developed from rough equestrian games played by the mounted nomadic peoples of Central Asia, both Iranian and Turkic. 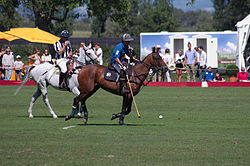 ^ "polo | sport | Britannica.com". britannica.com. Retrieved 14 August 2018. ^ a b c Canepa, Matthew (2018). "polo". In Nicholson, Oliver (ed.). The Oxford Dictionary of Late Antiquity. Oxford: Oxford University Press. ISBN 978-0-19-866277-8. ^ "Playing Polo in Historic Naqsh-e Jahan Square?". Payvand.com. 29 October 2007. Retrieved 25 January 2012. ^ Kazhdan, Alexander Petrovich, ed. (1991). The Oxford Dictionary of Byzantium. New York, New York and Oxford, United Kingdom: Oxford University Press. ISBN 978-0-19-504652-6. ^ "Touregypt.net". Touregypt.net. Retrieved 25 January 2012. ^ Malcolm D. Whitman, Tennis: Origins and Mysteries, Published by Courier Dover Publications, 2004, ISBN 0-486-43357-9, p. 98. ^ Hong, Fan; Mangan, J. A. (18 November 2009). Evolution of Sport in Asian Society: Past and Present. Routledge. p. 309. ^ "Manipur Polo – Indianpolo.com, polo, polo in india". Indianpolo.com. 25 March 2007. Retrieved 25 January 2012. ^ del Carril, Justo. "The equipment". Essential Tips Polo. p. 13. ISBN 978-987-02-7039-3. ^ "Rule F12 International Rules for Polo" (PDF). Federation of International Polo. Archived from the original (PDF) on 18 August 2018. Retrieved 8 December 2018. ^ "History of polo | Royal Polo Club Rasnov". royalpoloclubrasnov.ro. Retrieved 2 December 2017. ^ "Polo Club". www.calcuttapolo.com. Retrieved 2 December 2017. ^ "Polo Basics: Quick facts about Polo". blog.palosantohotel.com. Retrieved 28 July 2016. ^ "FIP World Cup VIII – 2007". Polobarn.com. Retrieved 25 January 2012. ^ 2 June 1876 Archived 26 March 2012 at the Wayback Machine The Galveston News: At Denison Monday evening while Messers Harold Gooch and Will Lowe were practicing at the game of polo, quite a serious accident happened to former. Mr. Gooch's saddle turned throwing him into the ground when his horse gave him a severe kick, cutting a gash about five inches long across his head over the right ear. Dr. Berry rendered the necessary medical attention, and Mr. Gooch is doing well. 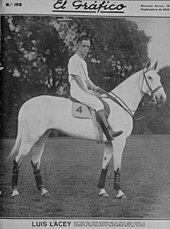 Will Lowe, Secretary of the Denison Polo Club, wrote James Gordon Bennett asking him if arrangements could be made for a match game between the Denison and New York Clubs. Mr. Lowe received a letter from Mr. Bennett Monday, in which he says he will lay the matter before the club at the next meeting. There is little doubt the New York club will invite our boys to play them. The Denison club will go into training at once, as they are confident the game will come off. ^ "Gracy Travel – Balcones Ranch" (PDF). gracytravel.com. Archived from the original (PDF) on 26 March 2012. Retrieved 28 July 2016. ^ "USPA Rulebook" (PDF). uspolo.org. United States Polo Association. Retrieved 8 November 2017. ^ "RULES OF THE GAME - United States Polo Association". United States Polo Association. United States Polo Association. Retrieved 8 November 2017. ^ "The rules". Polo on the Beach, Watergate Bay. Watergate Bay Hotel Ltd. Retrieved 15 March 2016. ^ "Aspen World Snow Polo Official Website". Worldsnowpolo.com. Retrieved 25 January 2012. ^ NaaniiGlobal, Polo & Quality Lifestyle Magazin 'en Vogue'. "FIP Snow Polo World Cup China". NAANII GLOBAL Polo & Family Lifestyle '-Magazin 'en Vogue'- www.naaniiglobal.com. ^ NaaniiGlobal, Polo & Quality Lifestyle Magazin 'en Vogue'. "World Polo Tour 2018, 34th Snow Polo World Cup St. Moritz 2018, Team CARTIER wins again world's most prestigous Snow Polo Tournament!". NAANII GLOBAL Polo & Family Lifestyle '-Magazin 'en Vogue'-. ^ Carlebach, Michael (2011). Bain's New York: The City in News Pictures 1900-1925. New York: Courier. p. 143. ^ "Steckenpferdpolo: Trendsportart in Düsseldorf im Rheinpark - Trendsportart Steckenpferdpolo: Ich glaub', mein Gaul holzt, Spiegel September 2014". spiegel.de. Retrieved 28 July 2016. ^ "HPA – Hurlingham Polo Association". Hpa-polo.co.uk. Archived from the original on 25 January 2012. Retrieved 25 January 2012. ^ "Left-handed Polo Players". ryanpemblepolo. Retrieved 28 January 2018. ^ "Hurlingham Polo Association Rule Book 2018" (PDF). Retrieved 16 July 2018. ^ Laffaye, Horace A. (2004). The polo encyclopedia. Jefferson, N.C.: McFarland. p. 28. ISBN 0-7864-1724-2. ^ RULES AND RULE INTERPRETATIONS of the UNITED STATES POLO ASSOCIATION (PDF) (2017 ed.). United States Polo Association. p. 64. Retrieved 9 November 2017. ^ News, World Polo (7 October 2015). "Outdoor Polo Ball". World Polo News. Retrieved 9 November 2017. ^ "About the Club". Royal Selangor Polo Club. Archived from the original on 19 October 2018. Retrieved 30 March 2016. ^ "History of Polo in Malaysia". Royal Malaysian Polo Association. ^ "Pakistan Tourism Department notice". tourism.gov.pk. Retrieved 28 July 2016. ^ David, Ceri (23 November 2008). "Going Polo". Sunday Herald Sun. pp. Sunday magazine supplement (pp. 20–21). ^ Eimer, David (25 October 2008). "The Daily Telegraph". The Daily Telegraph. UK. Retrieved 25 January 2012. ^ "NDPpolo.com". Ndhpolo.com. Retrieved 25 January 2012. ^ "The Country Club, Bahrain". countryclubbahrain.com. Retrieved 28 July 2016. ^ "Polo & Riding - Life in Jordan | The Royal Jordanian Polo Club". sites.google.com. Retrieved 28 July 2016. ^ "Archived copy". Archived from the original on 7 July 2011. Retrieved 26 May 2011. CS1 maint: Archived copy as title (link). ^ "Polo Wicklow - Index - Polo in Ireland - Polo Wicklow". polowicklow.com. Archived from the original on 30 June 2016. Retrieved 28 July 2016. ^ Maharaja Sawai Man Singh II Museum: Night Polo Ball. Penina Meisels and Michael Cronan (1992). Polo. San Francisco: Collins Publishers. ISBN 0-00-637796-3. Santiago Novillo-Astrada, Raphael De Oliveira and Uwe Seebacher (2009). Simply Polo. Munich: BookRix. ASIN B00XKVIYOK. This page was last edited on 24 April 2019, at 00:03 (UTC).